I read the book that the new Stephen King miniseries 11.22.63 is based on shortly after it first came out several years ago. Stephen King novels can be hit and miss, though I will admit, I’ve enjoyed far more than I haven’t. Screen adaptations whether large or small are another story. But there’s no denying that King’s creepy tales make for interesting premises, which explains why so many make the trek from page to screen. 11.22.63, a Hulu Original, gets off to a great start in my opinion. The opening is almost identical to the book. We start with a grizzly tale from a school janitor, where he tells us about the night that changed his life. The night his father killed his whole family... except for him. Jake Epping is a high school teacher who also helps adults get their diplomas later on and he’s affected by this story. It’s one of the few things that give his life meaning, as he doesn’t have much else going for him. High schoolers are hard to engage, his wife just divorced him — Al Templeton runs the diner that Jake likes to eat at and he’s noticed his patron’s discontent. What Jake notices, however, is how one minute Al is serving him a sinfully inexpensive hamburger and five minutes later, he looks to have aged a decade and is hacking up a lung. Concerned for his friend, Jake demands to know what is going on. Al tells him to step into the supply closet in the back of the diner, and take a look around. When he comes back out, Al will tell him everything. Jake is understandably skeptical. But stepping into the closet has him stumbling out onto an empty lot. And all around him, there is a different world. Old-fashioned cars, music, smells, sights, sounds... Understandably rattled, Jake goes back and demands to know what he just experienced. Al tells him that it’s October 21, 1960. He also tells Jake his big plan to go back and prevent the assassination of John F. Kennedy (which won’t take place for another three years). Jake thinks this is all madness — that messing with past events could be catastrophic. Not to mention the fact that he doesn’t know if anything done in the past will “stick,” so to speak. Al has Jake go back through the closet, inscribe his initials into a tree sapling in 1960, and then return to see if they’re still there. When the initials “JFK” are still on the tree, back in the present day, Jake is convinced. Al fills Jake in on his whole plan, because he needs Jake to take his place. Al got as far as 1962 before he was diagnosed with cancer and had to return to the present. Has extensive notes, credit cards, ID, and money for Jake to use. Everything is set up for him. But Jake balks. He would be spending three years in the past, even if it’s just the equivalent of two minutes in the present. It’s a huge undertaking and he’s not ready to commit. He leaves Al then. But real life proves to Jake once more that not only is there nothing there for him, but that maybe he can help fix things by going into the past. It’s a temptation he can’t resist and he returns to Al’s house only to find the man has died. So Jake decides to take the plunge, going through the closet and — if you’ll pardon my hyperbole — into the arms of destiny. Jake secures a suit and hat to wear, gets a shave and a haircut, all the better to blend in with the time period. He has a pleasant slice of pie, served to him by his future co-worker at the high school, back when she was still young and full of hope and dreams. With Al’s list of sports bets in his pocket, Jake makes a wager on a boxing match that, naturally, turns out well for him. Unfortunately, the men he’s bet against aren’t terribly happy that he won and one of them tries to jump him at his hotel room. He clobbers the man and speeds off in his car, vowing to be more careful moving forward. From here, Jake sets off on a road trip across America, headed toward Texas where he has to find Lee Harvey Oswald and track his movements to determine if he was, in fact, the man who shot Kennedy. On the drive there — in addition being amused at the campaign posters for Richard Nixon — he is disgusted by the Jim Crow laws. I imagine that it would be jarring to see the reality of such systemic racism staring you in the face. Jake decides to tempt fate and tries to call his father from a payphone. Massive interference prevents the call from going through. Then, moments later, a car careens through the phone booth, killing the driver. Jake has a vision of the driver opening her eyes, telling him, “you shouldn’t be here.” Decidedly creepy. But this is Stephen King so I expect little else. Jake is distraught when he returns to the boarding house, horrified that he might have caused this woman’s death simply by trying to contact his own father. Time to refocus on what he was back in 1960 to do. Al had told him to follow a man called George de Mohrenschildt, a rich bureaucrat that becomes good “friends” with Oswald in 1962. Al believed him to be Oswald’s “handler” — meaning he believes Oswald was ordered to shoot Kennedy, and was not acting of his own volition. When Jake follows George, he takes him to a rally held by Kennedy, who is running for president. Jake is re-energized, seeing the amazing historical figure that he’s meant to save. After the rally, Jake follows George to a reception where he sees the man embracing Jackie Kennedy, as though he’s a close friend of hers. Before he can see more, he’s chased away by agents suspicious of his intentions. He hides in the basement where he’s swarmed by irate cockroaches (no, really!) and then knocked out by the pursuing agents. They question him and Jake tries to play it off that he’s just a big supporter of JFK. One night, while following George as he took his wife out to dinner, Jake watches as George meets with two gentlemen, possibly from the CIA. He doesn’t get much out of the exchange but he does hear Lee Harvey Oswald’s name get mentioned. Jack’s thrilled with the news he discovered — that Al’s supposition was correct. But later, he returns to the boarding house to find it engulfed in flames. All of his belongings are burning up and the nice boy — the son of the lady who runs the boarding house — is gravely injured. In the smoldering ruin, Jack finds that most of his files from Al were destroyed. Discouraged, Jake decides he’s going to go back to Maine. He’s not cut out for this job. On the drive back, he stops to look at a map in Kentucky and he recalls the story the janitor from his class told about the night his father killed his family on Halloween. It just so happens, Halloween is upon them and he’s near Holden, Kentucky, where the crime took place. Maybe he can do one thing to help. He watches as Frank Dunning, the father, stops to pick up young Henry Dunning for a day with his father and it’s clear, the man has an evil air about him. Will Jake be able to help? I find that the show diverges from the book enough to keep me on my toes and interested to see what is coming next. Things are happening a little out of order, and maybe it’s been a while since I read the book, but I found myself on the edge of my seat. This is a fantastic collaboration — the mind of Stephen King paired with the genius of J.J. Abrams. 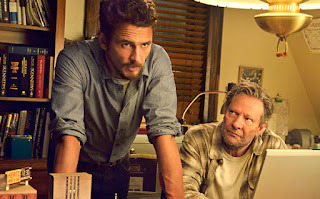 The cast is also amazing, with James Franco playing the lead and the likes of Chris Cooper and Josh Duhamel filling out the cast. But beyond that, it’s a literal "who’s who" of character actors, turning in solid performances. I saw enough of 11.22.63 to make me want to tune in next week. That’s really the first goal of a pilot episode, isn’t it?